ClickUp offers plenty of powerful features to help you take notes, monitor an agenda, and set action items that hold your team accountable in one place! Create a Project called "Team Events" with a List called "Meeting Notes". 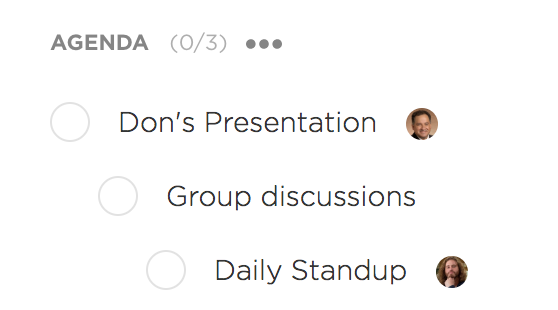 You can then create a task in this List for each meeting! With our Custom Fields feature, you can create a unique task field to describe the date and type for each meeting, as well as who will be attending. In the picture above, we used the date, dropdown, and text fields. Super rich editing and image embedding in a task's description allow you to get creative when taking notes for a meeting! Add tags to give more description about what's going on in the meeting ("team event", "urgent", etc). Checklists are perfect for keeping track of simple action items. You can nest and assign specific line items, or even save a checklist as a template for later use. There's no need to manually create a task for every meeting. 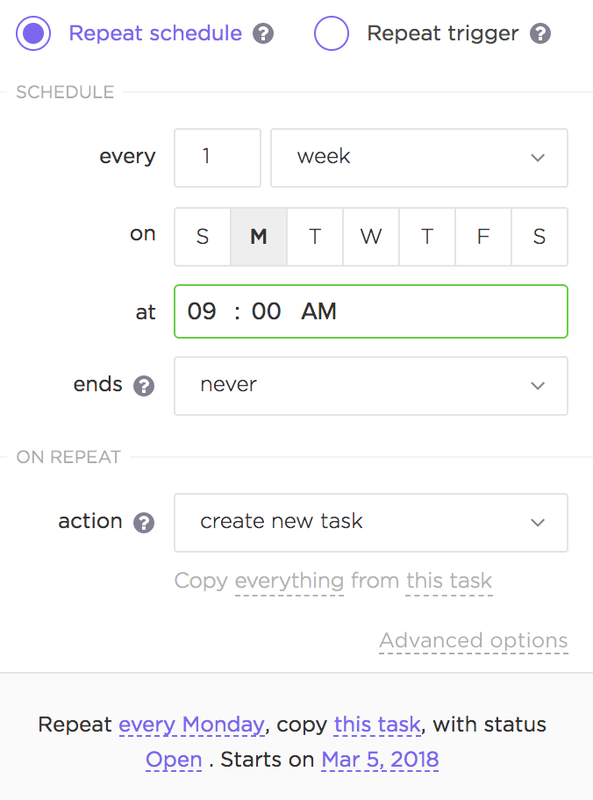 Use our recurring tasks feature to trigger them automatically! Let's say you have a meeting every Monday at 9:00 AM. You can set up a task with your checklist and outline to be created every Monday at 9:00 AM! This feature is perfect for keeping track of simple checklist items, brainstorming sessions, or meeting notes. Your notepad is for your eyes only, so other users won't be able to see what you've written. Slack's Call feature offers the perfect solution for hosting a meeting with your teammates, whether or not they work remotely. With ClickUp's Slack integration, it's easy to incorporate and reference your task workflows while hosting a call on Slack! Check out these docs to learn more. Have better way to use ClickUp for meetings? Tweet at us 🐦OR leave your suggestions here!